Mmm....Chocolate Lover's....we have got some thing for you. Chocolate, Chocolate and more Chocolate! In the Assortment I have included all of my Chocolate Cookies and included Assorted Lindt Lindor Truffles. I love these truffles! They were my Great Grandmother’s FAVORITE. Includes; Chocolate Coconut Macaroons, Double Chocolate Sea Salt and Chocolate Sea Salt Shortbread as well as a generous sprinkle of Lindt Lindor Truffles! All nested in a beautiful basket. A gift sure to please the most addicted chocoholic! We strive to bring the best possible service within the specialty food industry to our wholesale customers.To request wholesale information, please telephone us at 413-243-3370 or via email. Please contact us at 413-243-3370 Monday-Friday 8:00 a.m. to 3:00 p.m. EST. Or, email us. We respond to all inquiries within one business day. Please contact us for information on minimums. Initial orders are shipped only when prepaid by credit card. We accept American Express, Visa, and MasterCard. Wholesale customers may apply for terms, however, terms are not automatically granted. Please allow 2-3 weeks for processing. Any checks returned due to insufficient funds are outsourced to a third-party collection company. A fee will be applied at their discretion. Klara’s Gourmet Cookies reserves the right to revoke payment terms at any time, without notice, and reinstate prepaid terms using American Express, VISA, or MasterCard. 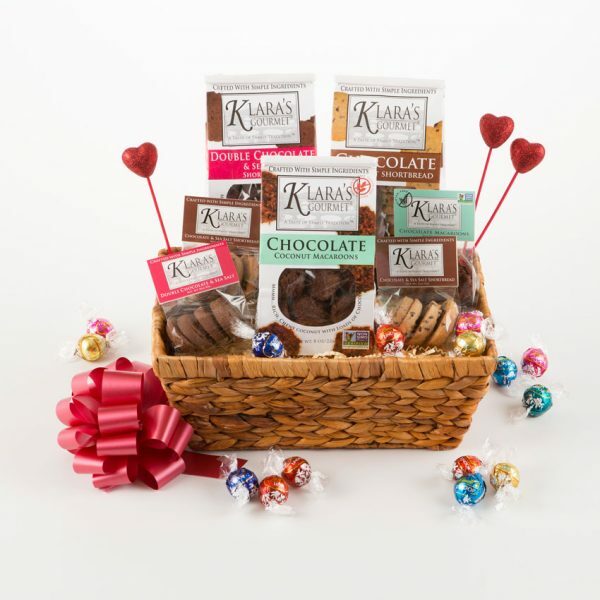 Klara’s Gourmet Cookies ships FOB Lee, MA. Credit or replacements will be issued for damaged or missing goods reported within 48 hours of receiving delivery. Please note any damages on the bill of lading when receiving freight deliveries, and hold damaged goods for at least 48 hours. Photograph shipping damage and email them to us within 48 hours. UPS reserves the right to inspect damaged goods prior to settling a claim.